Before we begin, a disclaimer: This guide is based heavily on personal opinions and approaches. It may not be the ideal solution for each and every player, but it’s worth giving it a shot. Also, because this is a text guide, I’m able to make changes in case something is not clear. The written content continues where the YouTube channel left off, so it’s recommended to watch the body of work in it if you haven’t yet. It’s also highly recommended to watch the remake of the Guilty Bits episode for Eddie. Click the link to watch it now and come back to this guide afterwards. This is not a guide for the Xrd version of Zato. I won’t be discussing the specifics of this version but about his general mechanics, which makes this guide applicable to any version of the game. First, let’s address the misleading notion that Zato (formerly Eddie) is a “hard” character to play. Difficulty can be divided into two different main aspects: tactical and technical. In the tactical aspect, the way I see it at least, Zato can either be easy or hard depending on the level of play. At first he’s hard because of the very concept of the character; controlling both the character proper and his shadow. Then there’s a level of play where it’s easier to do well with some extremely strong moves and tactics, and then at higher levels of play the crutches don’t work as effectively anymore, and Zato becomes hard again, when he needs to be used to his full potential to shine. In the technical aspect, it’s not very appropriate to call Zato “hard.” It’s more accurate to say that he’s unique to control. When you learn to do a fireball and dragon punch with Ryu, it’s hard at first, but after you get used to it you can easily do similar special move motions with other characters, and in other games as well. This may lead you to believe the other characters’ moves are easy to perform, because you are relying on overlapping skills and past experience. Zato, with his mechanics of holding and releasing specific buttons, will require muscle memory that you never had a reason to master before in other games and characters. So while even veterans have to start from scratch with him, he doesn’t require tight timing, convoluted joystick motions, or any of the things that usually make a character hard to play. 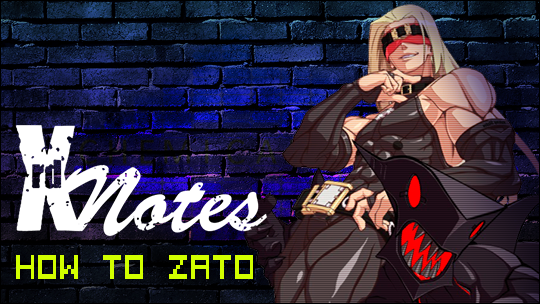 When the shadow is not in play, Zato is like any other character. The weird control method starts only once the shadow is out. A good approach to controlling Zato while the shadow is out is to always keep in mind two phases related to your button presses: the press phase and the release phase, i.e. the Zato phase and the shadow phase. Remember, the shadow’s attacks occur on button-up, when the button is released. Keeping the two phases in mind will allow you to get used to flow of the character. When you press a button, keep it held down. If you are doing a series of presses, keep pressing each subsequent button while keeping the buttons you have already pressed held down. When you are done with your chain and your fingers are holding buttons, release one specific button first, and release the rest immediately afterwards. It doesn’t matter which button you release first, though it can and should be a different one every time. Just ensure you make a conscious effort to separate the first release from the rest. These two habits will help you master the muscle memory that creates the basic attack rotation between Zato and the shadow, and will allow you to perform most of Zato’s combos. There are still some limitations on what you are able to do, because each button is bound to both an action by Zato and an action by the shadow. So you can’t control one of them freely without making the other one act as well. Stealth Pressing means that you press a specific button to “load” your shadow with an attack, but without having Zato perform his own button-bound move at a bad time. For example, you want to have a shadow S (Nobiru) “loaded” — the S button held — so you’ll have an anti-air option in case the opponent jumps as you, but in this specific moment you also don’t want to risk Zato and have him whiff a slow S normal. One way to achieve this is to whiff a command throw instead. It’s done with the S button and if you whiff it half screen away it’s much faster to recover compared to far 5S or 2S. Another way is to whiff a different move and stealth pressing during its animation. For example, you whiff a 5P and hold the S button during the 5P animation. The problem is that if the shadow is ready to act, you just pressed another button, so you’ll need to hold it down as well. This works well if you wanted both shadow P and shadow S “loaded” anyway to be able to choose between them, but if you only wanted shadow S it’s inferior to whiffing the command throw. If you want to “load” 2 buttons during neutral and neither of them is D, you can also simply perform a split second Faultless Defense with these 2 buttons and keep them held as you go back to neutral with the joystick. Just keep in mind that keeping 2 buttons pressed limits you heavily as it triggers Faultless Defense when you try to move backwards and spends super meter, so only use this in brief, specific moments. These were two methods concern whiffing. Now let’s talk about methods that apply when your moves connect. If you try to stealth press S during a P that connects you get Zato to cancel it into S, which you may not want to do because you had a different chain in mind. Besides changing your Zato chains to fit the shadow actions, you have two additional methods to stealth press during chains. You can stealth press during a part of the chain which does not naturally cancel into a specific normal. For example, close 5S cannot cancel backwards into 5P. This means that while S connects you can stealth press P and Zato won’t do anything. So by pressing and holding [S] [P] [H] Zato will do S-H and you’ll have a shadow P ready to be used. The other method is to press a button which can be canceled into, but early, before the cancel window starts. For example, press and hold 6P, and before it even hits also press and hold S. Zato will not cancel 6P into S but you will have the S pressed and shadow S ready to be used. These methods of stealth pressing will also help you in specific combos. One last important thing is that it may be easier for you to “make sense” of the neutral situations with the shadow out if you divide them into two types: either you are sure the opponent will be at the area you are about to attack or you aren’t sure. If you are sure, then both Zato’s next attack and the shadow’s next attack should cover the same area, but with different timings, rotating one after the other. If you are not sure — the more common case — then the second attacker may need to cover a different area, in case the opponent goes around the initial attack. If you have time to react and choose the proper attack, great, but if you don’t then it’s better to play it safe and cover the blind spot. Zato’s horizontal attacks are mainly S and 2S, and his anti-airs are 2H and 6P. 6H covers both horizontal and anti-air angles but it’s slow and more situational. The shadow’s horizontal attacks are mainly P and K, and its anti-air is S. So after you attack with one, pick the other attack depending on the principles explained earlier. I hope this guide helps you play Zato more easily.